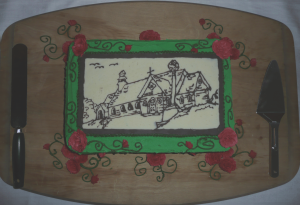 On Sunday July 29, 2012 we celebrated the 140th anniversary of St Peter on the Rock. The morning service was conducted by the Rev. Ian Fraser with more than 40 attending. Those of us who work to continue the ministry at St. Peter’s stand on the shoulders of many saints who have gone before us during the past 140 years. Last year, four of our dear friends were called to His kingdom. 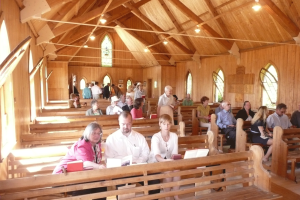 The anniversary service included tributes to Rev. Tom Ramsay, Venerable Stuart Martin and Venerable Francis Bancroft and Frank Cabot. Following the service Roger and Caroline Thomas hosted a lunch where we enjoyed the fellowship of friends new and old. Of course, we had cake! Canon Elton Scott started a tradition of holding a late afternoon bonfire and picnic on the beach. The tradition was revived by Ron Naylor in the 1980s when we held the bonfire at the Torwood Beach, thanks to the hospitality of Marge Mackenzie. 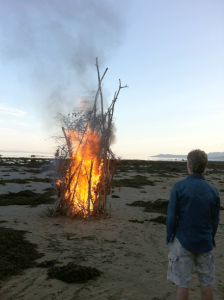 This year we held the bonfire at the Mackay/Harvey/Heughan beach. Thanks to the fire building skills of Mike Harvey and the wood gathering of all who attended we had a spectacular bonfire on the incoming tide flats.